Dental implants have transformed dentistry in the past few years. You can now replace lost teeth with permanent, rock-solid implant teeth that look, feel and more importantly function just like your own natural teeth. Start enjoying all the foods you love and smile with confidence! Implants is the most effective and permanent solution to replace a single missing tooth, or as part of a bridge replacing multiple teeth, or to securely anchor a denture or plate. Implants have become the preferred way to replace missing teeth as it does not require nearby healthy teeth ground down. Our office utilizes the latest generation implant technologies to make receiving dental implants a painless process. The majority of our cases can be done in 2 easy visits over the course of 6-8 weeks. 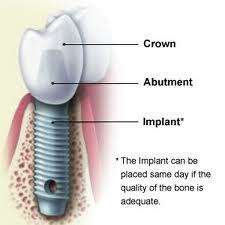 All implants inserted in our office come standard with a lifetime warranty. To find out more or to schedule a complimentary consultation please contact our office. Dental implants are replacement roots that are used to replace missing teeth. They are installed into the jawbone and gums where the roots of the teeth would normally be. They can be used to support a single tooth, or as part of a bridge, or to solidly lock dentures into place. With the latest surgery techniques receiving an implant has become easy and painless! In fact our patients are frequently amazed at how quick and painless the whole process is. Usually people find implants to be far easier to tolerate than say a root canal or getting a tooth extracted. With proper home-care, and regular maintenance implants are expected to last a lifetime. Our advanced surgery techniques allow us to install and finish dental implants usually in 2 easy visits. The actual implant installation often takes only 15-20 minutes. The second visit to install the crown usually will take 6-8 weeks after. Exact time frames may differ based on your health and condition of your mouth. Our doctors will be happy to answer all questions at your complimentary consultation visit. Can implants do anything for my loose, uncomfortable dentures? Regular dentures usually stay in one’s mouth solely through natural stickiness of the gums, or through usage of glue or denture goop. Dentures can be made to lock into dental implants for stability, so you can confidently smile, talk, and best of all enjoy all the foods you love. Often times we can retrofit your existing denture onto implants, so no new dentures required. Are implants covered by my insurance? Individual insurance plans vary, we offer a free complimentary benefits check with every visit.